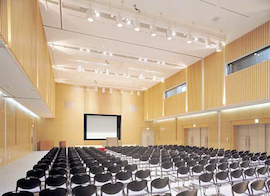 The Venue of the 1st World Community Power Conference is Corasse Fukushima located in 3 minutes walk from JR Fukushima Station West Gate. The easiest way to JR Fukushima Station is the Tohoku Shinkansen. From Tokyo Station, the Tohoku Shinkansen directly arrives at Fukushima Station (1.5 hour). One way ticket with a seat reservation costs ¥8,750 ($82 / €72).